Cornbread Supperian Michael Kennedy often provides this popular bread, and now has shared the recipe. Thank you, Michael! Pour liquid into mixture and stir it up. After it has risen, if you wish, toss in one to two pounds of chopped dried fruit and nuts: raisins, walnuts, apricots, dates, etc -- whatever you have on hand. (Preheat the oven to 375F while you add the extras and put the batter into the bread pans (sprayed with Pam or other oil). Turn batter into four Pam-ed or greased standard bread pans. It will come about 3/4ths the way up and rise from there. Bake in 375F oven for one hour and 40 minutes. Allow 1/2 hour for the loaves to cool on a rack after removing from the pans. You will need a good bread knife. One or two slices w/ good olive oil or butter in the A.M. is a full breakfast. 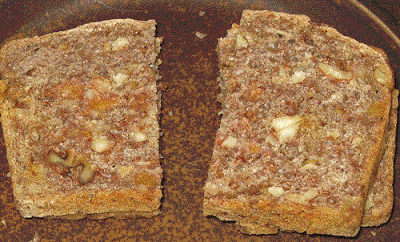 With the honey, fruit, and nuts a slice (1/15th of a loaf) is about 280 calories (or, I think, 5 Weight Watcher points). A loaf in a Zip-Loc bag freezes well.